I am admittedly not a gel nails girl. I just never have really gotten on that train. I support anyone who wants to get gels -- but because I change my polish so much (and because I love having tons of different colors at my disposal to apply and remove whenever I want), I just don't do gels. 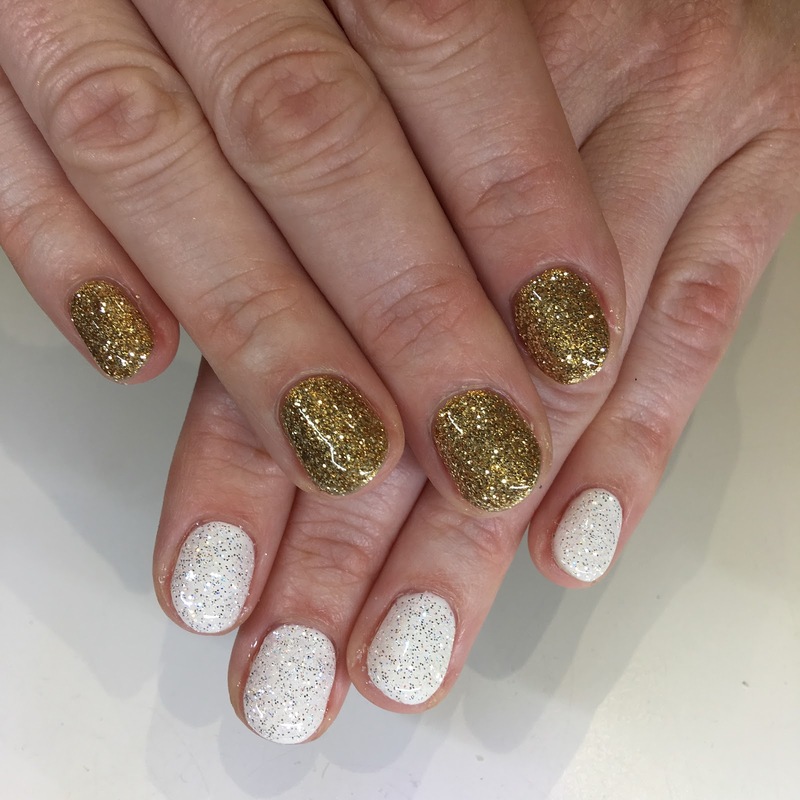 But I made an exception this weekend for my Christmas Tree Ornament Gel Nails by Katie Masters of Nail Thoughts! Get the picture? But, okay, she is SO MUCH MORE than that. The moment I walked in, she hugged me like we were old friends and excitedly pulled me to her nail station. And we chattered nonstop for my entire appointment -- which took over an hour, because Katie is METICULOUS! She spends a lot of time working on your nails to make sure they are in tip-top shape (no pun intended). Katie's Nail Thoughts space is within the Salon Republic space on 2nd Street in Santa Monica. I have to admit I got lost trying to find it! I didn't realize she was located inside Salon Republic, so I went into the office building next door and started wandering around. Then, just on a whim, I went into Salon Republic -- because I actually didn't even know what this space was. I thought it was just one salon, but it turns out Salon Republic houses many different independent contractors who all rent out spaces. It's beauty mecca! When I finally figure out how to find Katie, I followed the signs down the hall until I reached her at studio 50. The adorable logo on Katie's door ... and the reflection of me taking the photo. Oh, hey! And, of course, she wants to make sure she creates a design that you're going to love. I knew I wanted something holiday themed, but other than that, I was pretty open to interpretation. We threw a lot of ideas back and forth, and thought about including red in a more complicated design. But then Katie had the idea to theme my nails after Christmas tree ornaments -- and voila! Magic was born. I AM OBSESSED WITH MY NAILS! Check out all that glitter! Katie used a combination of white, holographic silver and gold glitter gels to create this look. We wanted one hand to be white/silver and the other to be straight up gold -- we both really liked the idea of the hands being totally different yet still working really well together. And, come on -- LOOK AT THAT GLITTER. I never, EVER turn down glitter, especially on my nails. And Katie's design did not disappoint! I like that it's simple but still something I can't get enough of. 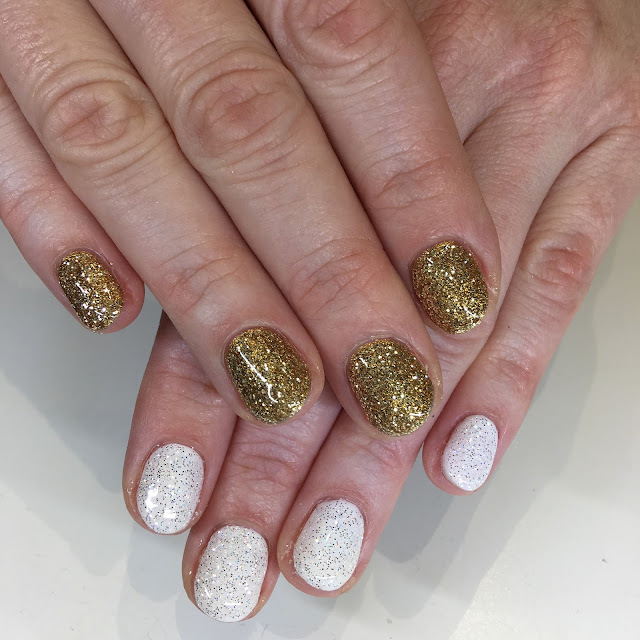 The more glittery, the better, and these nails definitely don't disappoint in the glitter department! These nails have me so excited for the holidays. Hello, December! Follow Katie Masters on Instagram here. To book an appointment with Katie, visit her on StyleSeat. Katie did an amazing job! I love the gold - so festive for the holidays! I'm with you on the gel train...I tried them for the first time Sunday (soak off kind...baby steps). So far I'm enjoying them. I love the gold but the white is pretty and interesting too. What a gorgeous job she did! Both colors are stunning, and I love them together! So Jamie! They sparkle like you do. I love the meticulous job she did too. I love that the hands are different but go so well together! I soo understad why you are obsessed with these nails! That gold is so pretty!!! I love the look of gels!